Tram missed? At least at the tram stop Sihlpost, there is no reason to grieve thereat. Directly behind it, in the premises of the Brooklyn Burger, the Burgermeister. This was the home of two years on the langstrasse, close to the Limmat river course and quickly found a large following in the area: Giuseppe Finazzo, owner of the castle master and a friendly host who is on intimate terms with all, put a passion of the day. From daily fresh-baked, brioche-like buns from the bakery, Gold and crusty fried Swiss meat, he conjured up a quality Burger. Served in the Körbli, were this to be the best in the city. A year ago, the conclusion was all of a sudden. Newcomers Finazzo, actually, a skilled heating technician, needed a break. Now he is back and has adapted the card slightly. All Apérosnacks: about a deep-fried cauliflower are, for example, Tätschli (6.90 Fr.) for the small Hunger, Wiener Schnitzel Bites (20.90 Fr.) or Chicken Wings (11.90 Fr.). 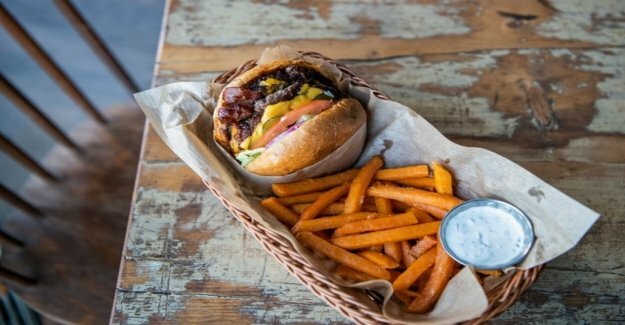 The "Signature Dishes" of the master, the long street Burger with double meat and double cheese, bacon, Jalapeños and house-made Barbecue Sauce (21.90 Fr. ), as well as the Cheeseburger (12.90 Fr.) taste is still tip-top, and so we try it on something New. very not tends Otherwise, the vegan kitchen, we overcome ourselves, the tofu Burger (10.90 Fri.) to order, and lo and behold: The is better than expected. This is mainly due to Finazzos Indian-inspired Mango-Curry-Sauce, the cucumber well with the spicy Tofu, the sour, the onions, and the sweet bread budding suits. The Chicken Burger (14.90 Fr. ), a crispy chicken breast hidden, tastes, and would be a suitable Anti-hangover Snack at 3 in the morning after the output: The castle master is on the weekend until the early hours of the morning in the open. The kitchen is so solid – the Service suffers however, if the Load is full, even on children's diseases. So it is in the narrow Local this Saturday afternoon is hardly anything young people want to treat themselves to a Burger. The waiting time per Person is about 20 minutes Away is a Take to long. to make matters worse, Finazzo and his Team must also deliver to the Bar next door with a Burger. Some of the guests are getting restless and complaining. The employee smile the Stress and apologize. You can't help it that the love of the Zurich for the castle master so intimately.